Thesis 2.5 is available now via automatic updates in your WordPress Dashboard, and you’ll want to update immediately to take advantage of a couple new cutting-edge features. In this article, I’ll show you how Thesis has the best and most flexible Schema support of any WordPress theme. After that, we’ll take a look at the new Global Site Tag, which massively simplifies the process of configuring your website with Google tools and services. Since 2013, Thesis has included Schema markup support, and Skins took advantage of this by specifying a default Schema on included templates. For example, the Classic Responsive Skin runs the BlogPosting Schema by default, thereby adding rich snippet data to every post and page of your site. Search engines love this! But what if you have a page that calls for a different Schema, such as NewsArticle or Product? Prior to Thesis 2.5, the only reasonable way to do this was to create a new custom template and specify a different Schema for that template. You would then need to select this custom template on any post or page that called for this different Schema. In my view, that’s too complicated to be a realistic option for most people. Even worse, the custom template approach is something that only applies to the current Skin. If you change your Skin in the future, these Schema associations will not carry over between Skins—not good! Thankfully, there’s a much better way to do this. Ideally, each piece of content should be associated with the Schema most pertinent to it. In other words, Schema is a content-level association and not a theme-, Skin-, or even template-level association. That’s why Thesis 2.5 adds a new Schema selector to your WordPress post editor, enabling you to associate a particular Schema with each post or page of your site. Now, no matter which Thesis Skin you use, your chosen Schema will take precedence over whatever defaults are defined in the Skin. Some Plugins like WooCommerce and Easy Digital Downloads (and many others) output their own Schema on certain pages. With previous versions of Thesis, this would have resulted in two Schema being output on the same page—the Skin default as well as the Plugin-specified Schema. 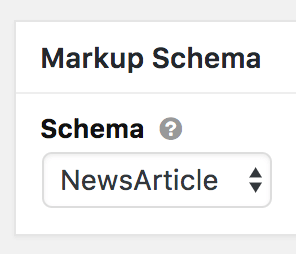 With the new Schema selector in Thesis 2.5, you can specify “No Schema,” and this will prevent your Thesis Skin from outputting any default Schema on this page. This clears the way for your Plugins to add their own Schema, ensuring you’ll have the most pertinent Rich Snippet data on each page of your site. Pro tip: Both Post Boxes and Query Boxes (the two places where default Schema can be specified within Thesis Skins) now respect the post/page-level Schema settings. This means you’ll always have perfect Schema output everywhere! Over the past couple years, Google has greatly expanded the tracking and tagging services it offers to provide deep, actionable data for webmasters. Even worse, all these scripts had different implementation requirements which turned this whole tracking/tagging process into a technical and organizational nightmare. But now that Google has introduced the Global Site Tag, all of this is about to change for the better. The Global Site Tag is a one-stop shop for Analytics and other tracking/tagging services Google provides. Services like Analytics, Site Verification, Tag Manager, Experiments, and more are available through the Global Site Tag, and you can control all this stuff from your Google account. In other words, there’s no longer a need to paste code in various places throughout your HTML to implement advanced Google services. Can I get an amen? If you’re a Thesis user who was already using the native Google Analytics implementation, your site will automatically switch to the new Global Site Tag when you update to Thesis 2.5. The internet is constantly in flux, and you need a theme that’s adaptable to this ever-changing landscape. Thesis makes it easy to keep everything up-to-date with the latest web standards and specs, and this leads to faster loading times, better SEO, and easier maintenance over time. On top of that, “instant upgrades” like granular Schema support and the Global Site Tag are poignant examples of how Thesis can level up your website in an instant. Finally, if you’d like more information on what’s new in Thesis 2.5, check out the changelog. If you don’t yet have Thesis, check out our freshly-updated Skin demo and then see which Thesis license is right for you!